Sometimes a little storytelling in the classroom brings a lesson to life. Here, we’re sharing one that helps illustrate why we do what we do. We were lucky enough to chat with one of our customers about his experience from a first-person perspective on the impact fundraising has had for his students. Dan Hofmann is a music teacher in Gurney, IL. Of the 328 kids in his school, almost one-third of them participate in one of the three bands he leads: 6th grade, 7th/8th grade, and the high school band. He decided to run a fundraising program to help afford the basic repairs and maintenance that his department requires. For example, the keyboard that had been missing a key for more than two years. When you have a budget of zero, it just doesn’t allow for the unexpected. In addition, he wanted to create an opportunity to reward his students for their hard work. “My kids are a mirror – they will give back to you what you give to them. Our Century Resources representative, had great energy and I knew from the start they were going to be a hit with the kids. We have 3 bands at our school; my Century representative hung out all day and met each one to kick off the program. Each presentation was just as energetic and fun as the others,” Dan said. Century Resources really enjoys working with educators like Dan. He happens to be in a situation where the program can genuinely make a difference for his school. Dan trusted the process of the fundraiser and teamed up with his Century representative. Together they were able to ignite the kids excitement while also giving his representative space to interact with the students directly. 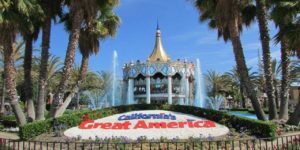 After raising $5,643 with the program, Dan was able to take their HS band trip to Great America where the band played for an hour, then enjoyed a day trip at the park! In the prior year, the trip had cost $45 for each of the 40 students. For some of the students, this cost was a hardship, and many had to take money out of their own pockets. This year, however, the trip was fully paid for from the fundraiser – and they even got matching tees to wear that one of the kids designed! Our Century Resources rep noted that their biggest reward was watching the program in action and truly having an impact. Century Resources is looking forward to another successful program with Dan and his students next year! Century Resources thanks Dan for all he does for his students, and for being a great role model for them.